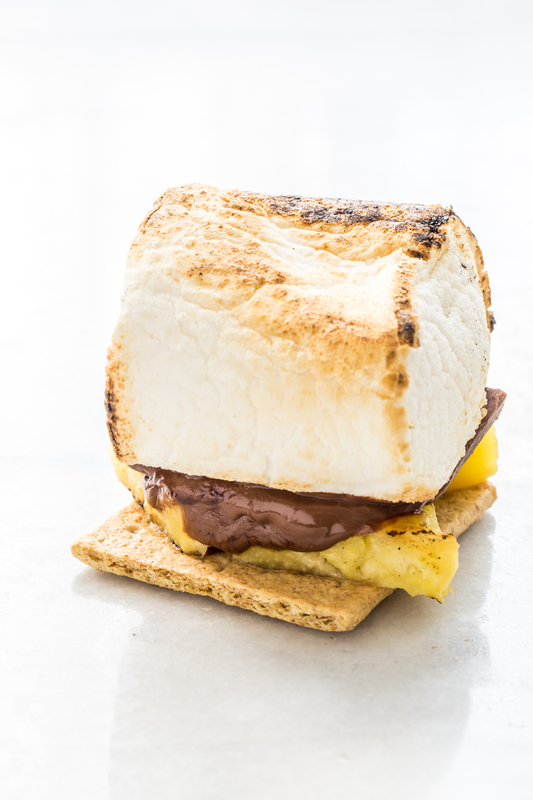 Grilled Pineapple S’mores take sweet, grilled pineapple and pair it with an ooey, gooey Campfire® Giant Roaster Marshmallow for the the ultimate s’mores experience! 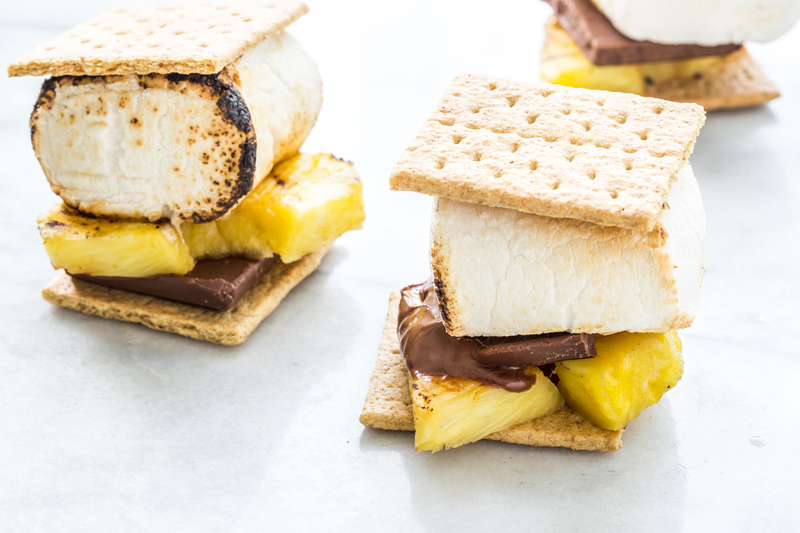 This post, Grilled Pineapple S’mores, is sponsored on behalf of Campfire® Marshmallows. All opinions are, as always, my own. It is finally feeling like summer weather round these NW Ohio parts. It’s been steadily in the 70’s for the last week or so and despite the rain, it’s been glorious. The weather lends itself to impromptu meals on our patio complete with an outside dessert aka: s’mores. You all know I love a great s’mores combo. Remember my Roasted Berry S’mores from a few summers ago? Those are still on rotation at our house. In fact, just make a big batch of the roasted berry sauce with cardamom and drizzle it generously over everything this summer. Then, last summer I tried my hand at some Sopapilla S’mores which were epic. So much cinnamon and sugar! When roasting a Giant Roaster, start by holding the marshmallow back from the flames. They tend to catch on fire quickly but the inside will not yet be soft. Holding the marshmallow a bit back from the fire allows the entire marshmallow to warm and soften. After a minute or two of this, then take the marshmallow closer to the flames to toast to your liking. I am a girl who likes a burnt marshmallow, but I live with some people who prefer a lighter toast. The heat from the grilled pineapple and the toasted marshmallow help to melt the chocolate and get it nice and gooey. These s’mores are best served immediately and often require two hands. 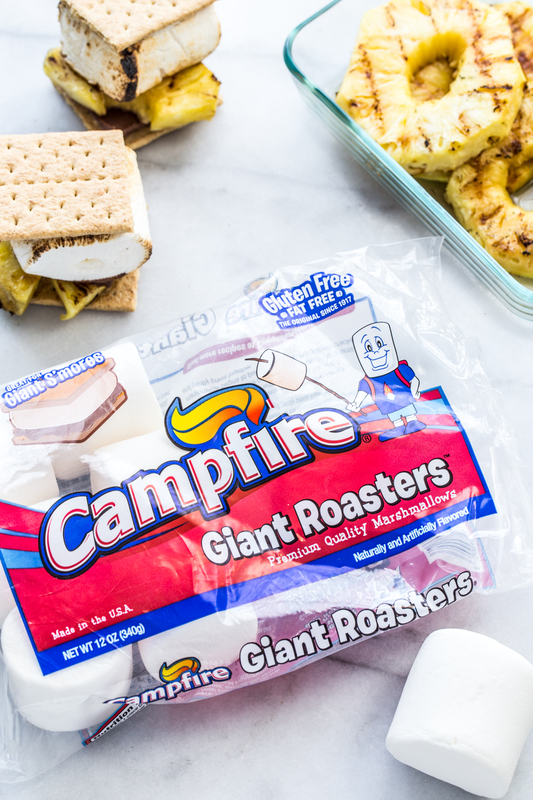 I will be sharing a few more s’mores recipes this summer featuring some great new marshmallow flavors from Campfire®, so be sure to keep an eye out for them. So you don’t miss the new flavors, you can find Campfire® on Instagram and Facebook where they will keep you up on all the latest marshmallow news. 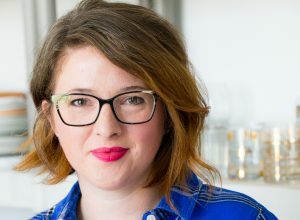 If you are looking for more marshmallow recipe inspiration for the summer, be sure to check out our Marshmallow Madness Pinterest Board. It’s all marshmallows, all the time! 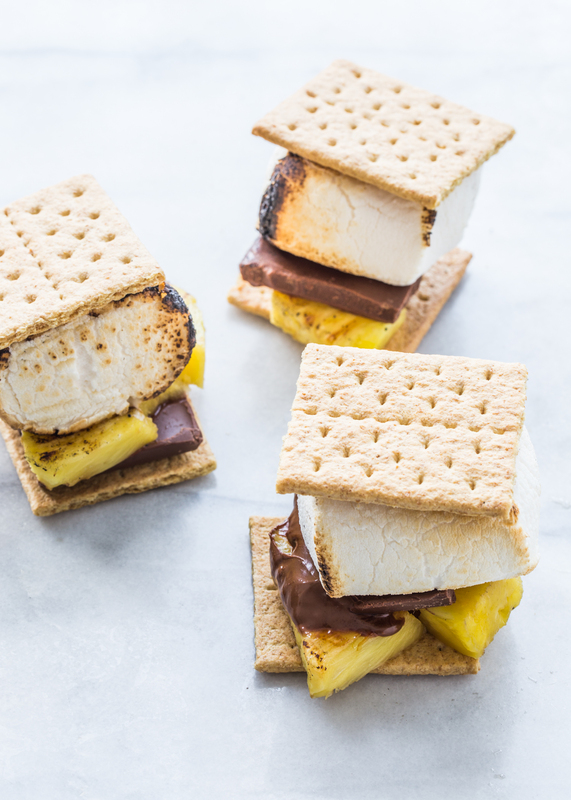 Grilled Pineapple S'mores take sweet, grilled pineapple and pair it with an ooey, gooey Campfire® Giant Roaster Marshmallow for the the ultimate s'mores experience! Roast Campfire® Giant Roasters to your liking. Place pineapple on the grill (either grill grate set over campfire or gas grill grate). Allow pineapple to cook until soft and juicy. Remove from grill. Cut pineapple slices in half. Place a square of chocolate on one graham cracker square. Top with half of a pineapple slice, one roasted marshmallow, and a second graham cracker square. Repeat with remaining ingredients. Serve immediately.